INKA Paletten GmbH, based at Siegertsbrunn near Munich, is Europe’s largest manufacturer of disposable pallets - with experience in the field of moulded presswood pallets since 1971. INKA pallets are made of the heat processed wood like particle board. For INKA presswood pallets, dried wood chips are compression-moulded under pressure and heat. They can be used as a space-saving substitution for wooden pallets and they are extremely suitable for use as export pallets, as they are not covered by the regulations for solid wood. INKA presswood pallets are regarded as “processed wood” as defined by ISPM 15/NIMF 15, which is why they constitute the perfect single-trip pallets for problem-free export to all countries worldwide! 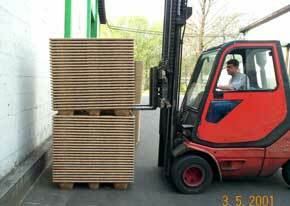 INKA-Paletten GmbH produces shipping pallets in all standard sizes from the 1/4 pallet to the CP3 format. A large network of 160 dealers in Europe and many other countries sells the transport pallets of INKA Paletten GmbH.